Home » Articles » Features » Preorder Chris Cander's THE WEIGHT OF A PIANO Today! 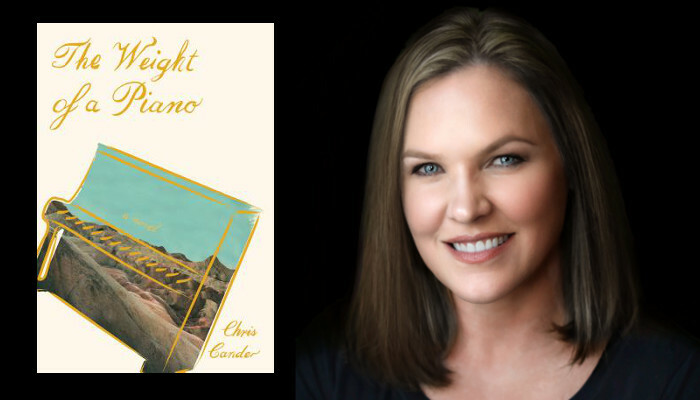 Preorder Chris Cander's THE WEIGHT OF A PIANO Today! Are you excited for Houston author Chris Cander's new novel? Pre-order today and reserve a copy that will be ready for you on release day! For fans of Ann Patchett's Bel Canto, Amanda Coplin's The Orchardist, and Annie Proulx's Accordion Crimes. A tour-de-force about two women and the piano that inexorably ties their lives together through time and across continents, for better and for worse. In 1962, in the Soviet Union, eight-year-old Katya is bequeathed what will become the love of her life: a Bl thner piano, built at the turn of the century in Germany, on which she discovers everything that she herself can do with music and what music, in turn, does for her. Yet after marrying, she emigrates with her young family from Russia to America, at her husband's frantic insistence, and her piano is lost in the shuffle. In 2012, in Bakersfield, California, twenty-six-year-old Clara Lundy loses another boyfriend and again has to find a new apartment, which is complicated by the gift her father had given her for her twelfth birthday, shortly before he and her mother died in a fire that burned their house down: a Bl thner upright she has never learned to play. Ophaned, she was raised by her aunt and uncle, who in his car-repair shop trained her to become a first-rate mechanic, much to the surprise of her subsequent customers. But this work, her true mainstay in a scattered life, is put on hold when her hand gets broken while the piano's being moved--and in sudden frustration she chooses to sell it. And what becomes crucial is who the most interested party turns out to be. . .
CHRIS CANDER graduated from the Honors College at the University of Houston, where she was raised and still lives, with her husband, daughter, and son. For six years she has been a writer-in-residence for Writers in the Schools there, serves on the Inprint advisory board, and stewards several Little Free Libraries in her community. Her first novel, 11 Stories, won the Independent Publisher's Gold Medal for Popular Fiction, and her most recent, Whisper Hollow, was longlisted for the Southern Independent Bookseller's Prize for fiction. She is also the author of The Word Burglar, which won the 2014 Moonbeam's Children's Book Award (silver).